Sometimes, the best Halloween costumes are those that you make for yourself. 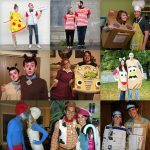 Even if you are not able to sew, or if you do not consider yourself to be particularly ‘crafty’ there are plenty of DIY costumes that any one should be able to pull off. 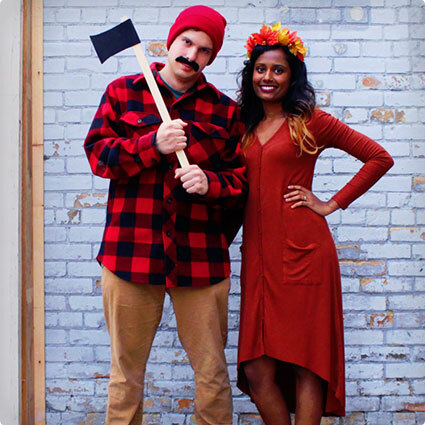 Take a look at some of our favorite DIY couples costumes below. 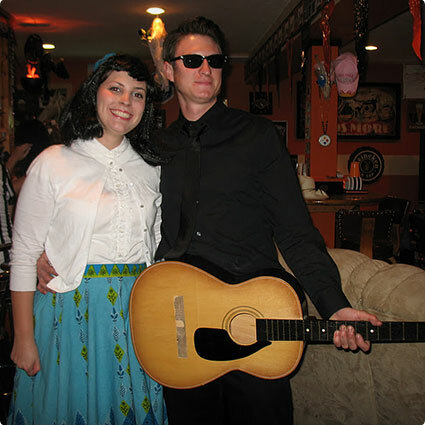 If you are looking for an easy couples costume this Halloween, then you cannot go wrong with ‘The Man in Black’ himself Johnny Cash and his beloved June. The great thing about this costume is that it can more or less be put together with items that you may already have in your closet. Anything you do not have on hand is easily sourced from a thrift store so it will be fairly inexpensive! 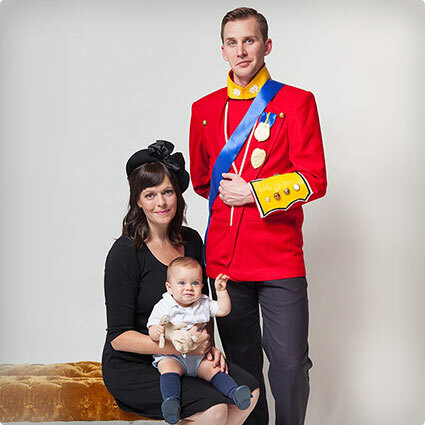 If you fancy yourself as royalty, then you will love dressing up as everyone’s favourite prince and princess – William and Kate! The costume for Kate is easy enough, especially given that the Duchess is known for wearing high street labels. William is going to take a little more work, but nothing to difficult. You get extra points if you have children who you can dress as little George and Charlotte! Frankenstein’s monster and his bride is a Halloween Classic and they are actually really easy to pull off using some thrift store clothing and make up. 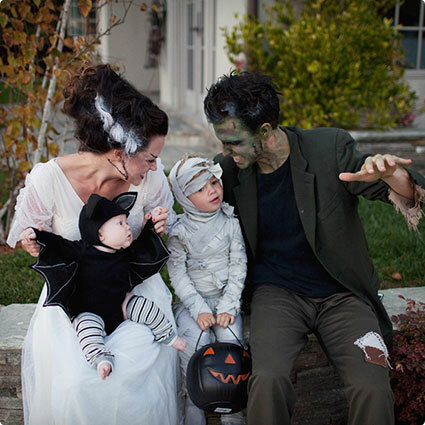 The family featured here decided to include the whole family with a baby bat and a little mummy to complete the group, but even just as a couple this makes a great costume choice. 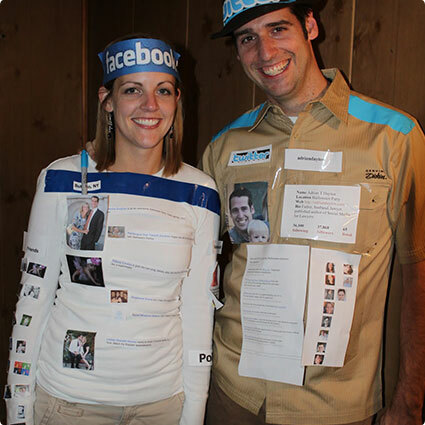 It seems like we live our lives on social media these days, so why wouldn’t you want to dress as Facebook and Twitter this Halloween? 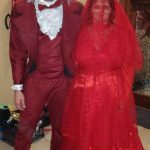 This couple explains how they managed to produce these costumes, but there is no reason why you couldn’t modify them a little if you are more into Pinterest or Instagram! The possibilities are endless! 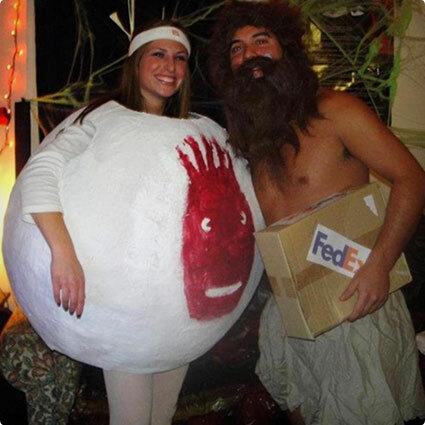 We love this Castaway Couple costume. The man is of course the Tom Hanks character while his partner is dressed up as Wilson! It is a pretty simple costume to make for yourself, and yet it is also one of the most effective. It really does look great and it is unusual enough that you are unlikely to duplicate anyone at the party’s costumes as well. If you are a fan of classic movies, then you are going to love this Singing in The Rain costumes. Again, these are costumes that you can put together with clothes from your own wardrobe, or at the very least using clothes that will be wearable again in everyday life. As the tutorial also points out – often men are resistant to dressing up in anything too crazy looking, so a costume centred around a suit is something to keep in mind if you find yourself with a slightly unwilling costume partner this Halloween! 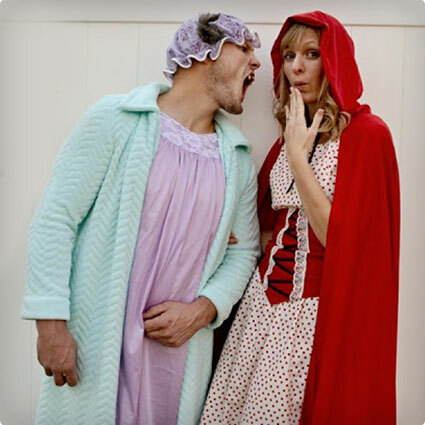 The best couples costumes are those that depict classic pairings and it doesn’t get much more classic than the pairing of Little Red Rising Hood and her Big Bad Wolf! We love this take on the pairing because the wolf costume is super easy and won’t require you to sew a full furry suit! Instead the tutorial shows how to simply add fur ears to a shower cap and make a tail so that the Wolf is in his ‘Granny’ disguise! 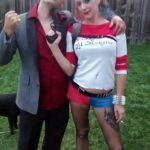 If you need a last minute couples costume then you ideally want something you can make from your own wardrobe maybe supplemented with dollar store items. These camp counsellors costumes do just that. Most of us have shorts and a t-shirt in the closet, right? 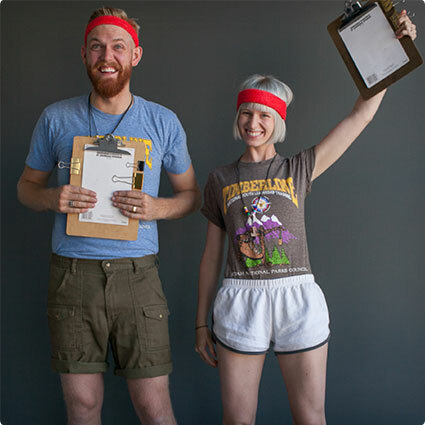 All you need to do is add a clipboard and headband – maybe a whistle if you can find one and you are good to go! This tutorial is aimed at children, but we see no reason why this cannot be adapted for adult Hobbit fans! It is going to require a bit of time and effort, but both costumes are based on ordinary clothing, which has been modified with paint and fabric. If you like a bit of a challenge then this one is going to be well worth the effort. 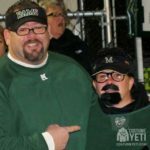 How cute is this couple’s costume? It looks so great and yet it is a super easy DIY! The pizza delivery boy costume is simple. Jeans, shirt, ball cap and a pizza box! The Pizza slice is a little more work, but not anything too taxing. 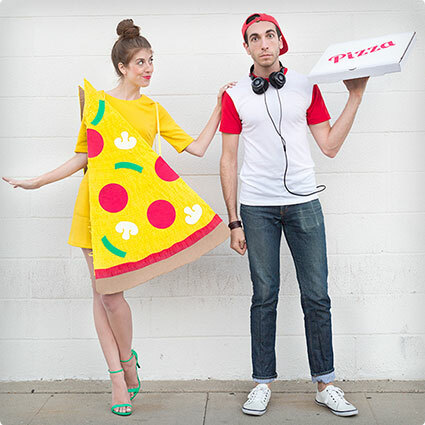 A yellow dress serves as the base and a cardboard tunic is made to represent the actual pizza! We love it! 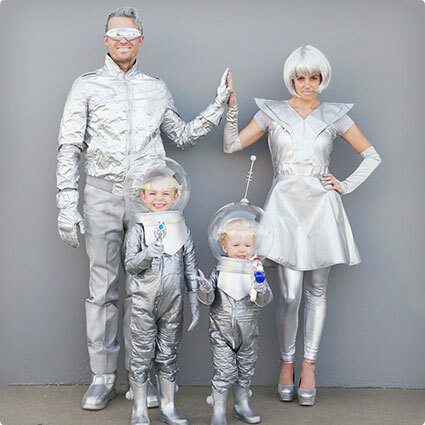 This tutorial will show you how to make an adorable space age family. 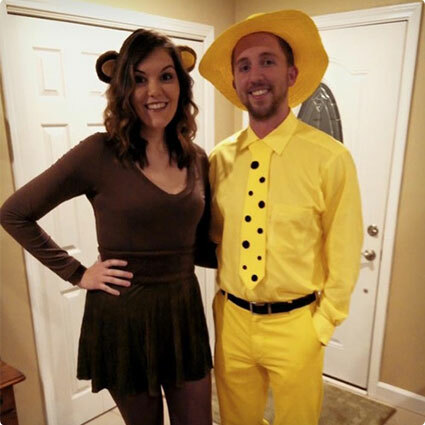 They included their children in matching costumes, but if you are just a couple without the kids then you can still pull this off as a twosome! It is a lot of fun and looks fairly easy to put together. 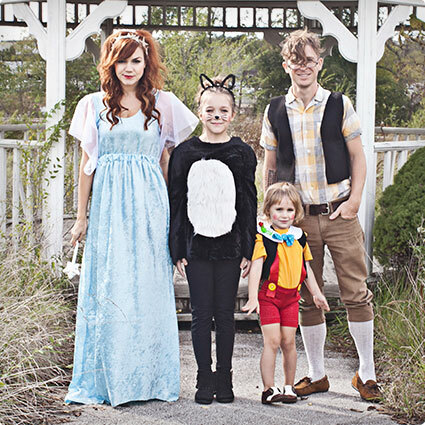 This is another cute family DIY costume, but again if you only need costumes as a couple then you could just opt for the Gepetto and Blue Fairy costumes – or if you wanted you could just follow the same steps shown for the kids Pinnocchio and Figaro the Cat costumes, but sized up to fit adults. 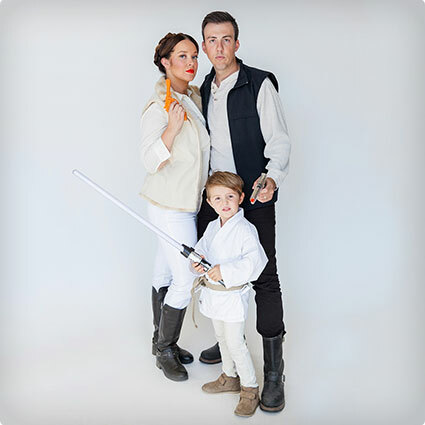 Han Solo and Princess Leia is a really easy couples costume to DIY since you can pretty much put these costumes together from your wardrobe since it goes with the Hoth version of Leia which is much easier to DIY than her iconic white gown or slave costume! 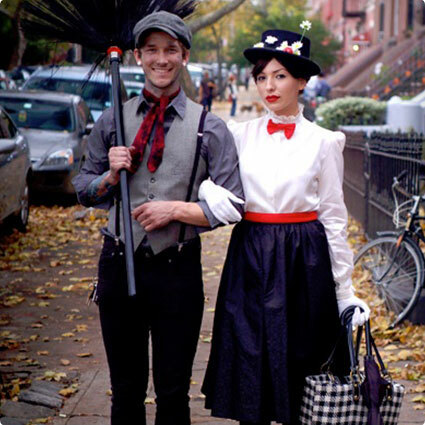 This is a beautiful, stylish take on Mary Poppins and Bert The Chimney Sweep! It is more or less put together using everyday clothes which is always a bonus! Even if you do not have the appropriate items, they are things you can pick up cheap in Target or at a thrift store. We love a Halloween costume that comes straight out of a scary movie and this is one that we haven’t seen before which is always nice to see! 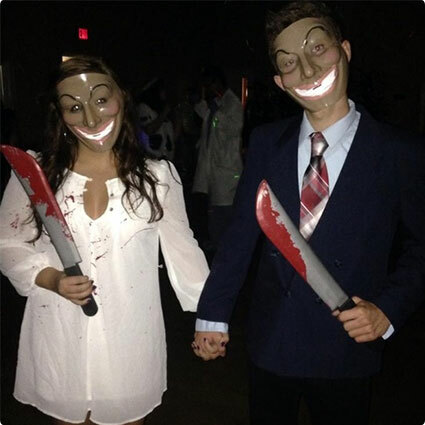 This creepy pair are straight out of ‘The Purge’ and the costumes are so easy to recreate. All you need is your own clothes and some dollar store props – plastic masks, weapons and a touch of fake blood! 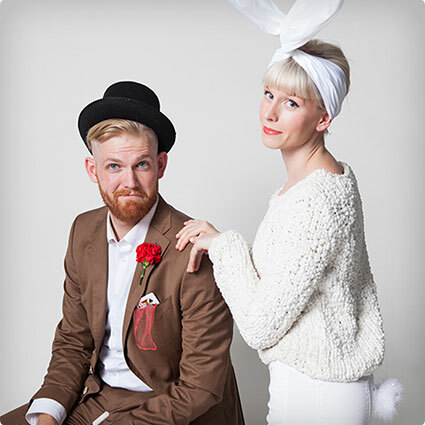 This is a really adorable take on a magician and his white rabbit. It almost has a bit of a hipster feel to it as well. 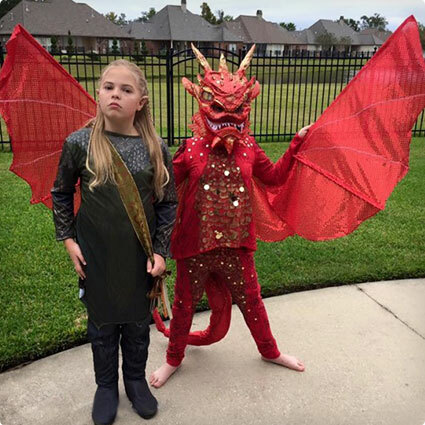 These costumes are two more excellent examples of building a really effective costume using everyday items of clothing that you likely already have lying around the house! 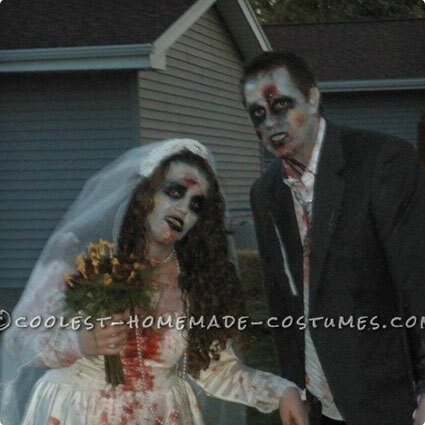 A dead bride and groom is always a great choice for a couples Halloween costume! The great thing is that, as this tutorial demonstrates, you can easily DIY it by destroying some old clothes or thrift store finds! Seriously, if you have never ripped up formal wear then you will not believe how much fun it actually is! 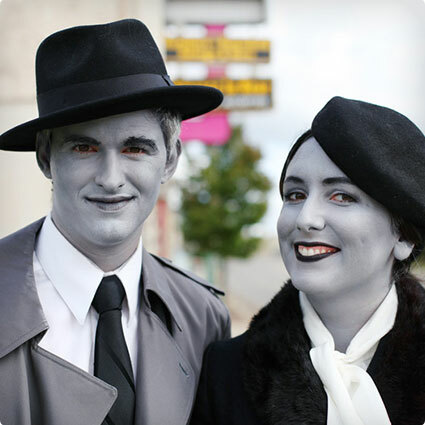 We love this film noir/ black and white movie star couple costume! It is such a clever idea. The overall effect is really amazing and yet it is actually really easy. You basically need to put together a period appropriate outfit in shades of grey, black and white and then you will be painting any visible skin grey. Pretty neat, right? 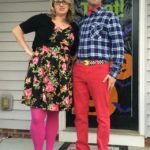 Here is another super easy couples costume from the last minute files! 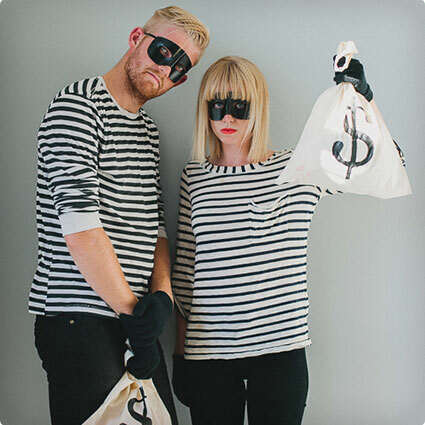 Dress up as a pair of bank robbers in black pants, gloves and a beanie and add a striped sweater to complete the look. You can even make your own loot bag by simply drawing a dollar sign on a canvas shopping bag with a black marker! Minimal effort required. If you are looking for a great couples costume then it really doesn’t get much better than these Buttercup and Westley costumes from The Princess Bride. For Westley you should more or less be able to scrounge up an outfit from pirate costumes past, but Buttercup’s dress will likely require a bit of sewing skill. 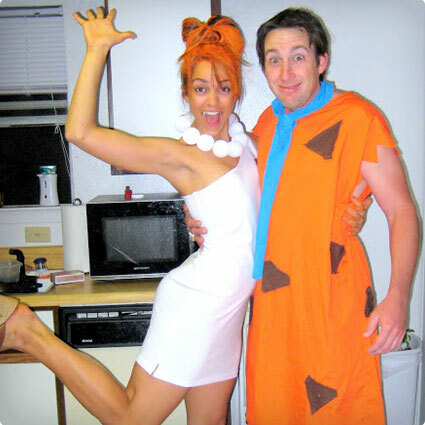 Fred and Wilma Flintstone make the perfect couple friendly Halloween costume. Not only so they go together just perfectly, but they are also comfortable and pretty easy and inexpensive to make. This great tutorial will walk you through the process of transforming into this modern stone age family! Strawberry Farmer & His Harvest! Sometimes it is great to think a little bit outside the box when it comes to your costumes. Instead of just looking for a couple from pop culture, why not think of other things that go together? 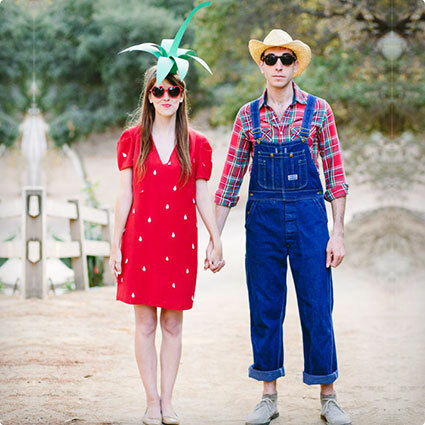 That is why we love this cute costume, which are a Strawberry Farmer and his strawberry! Isn’t it adorable? It is fairly simple to put together too! 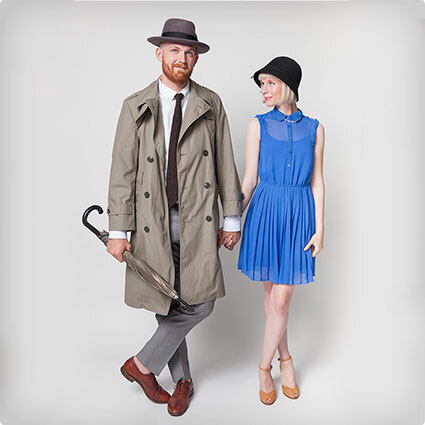 This is a really cute couples costume, which can be put together very cheap using thrift store finds! If you can’t find yellow clothes, opt for white and one of those yellow washing machine dye kits. The Curious George outfit is all brown with felt tail and ears. This is one for the couple that is full of fun! 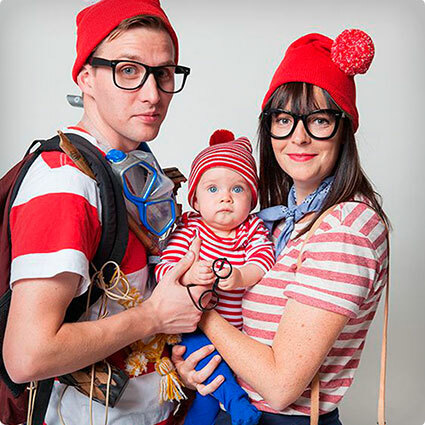 If you have found your perfect match then why not team up as a matching where’s Waldo character? It is a super cute costume, which is also really easy to put together with very little expense. Most people probably have a red stripey shirt at home and with just a few accessories you can become Waldo. 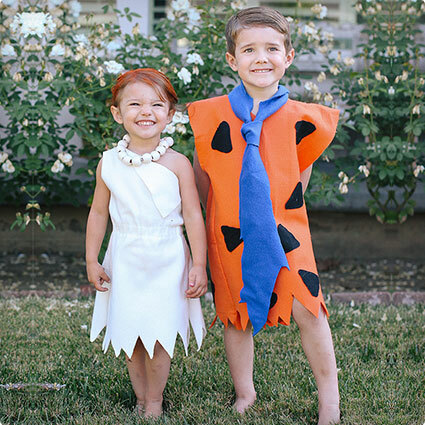 Here is another really easy version of the Fred and Wilma costumes. This one uses oversized t-shirts to great effect and we love the Styrofoam pearls which is such a clever idea! It’s great to see different versions of the same costumes because then you can pick elements from one and elements from another to see what works best for you. 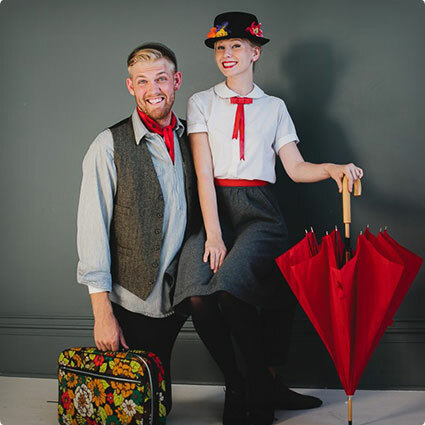 Here is another tutorial for a last minute couples costume and this time it is Mary Poppins and Bert. 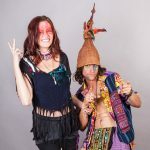 This one starts with some pretty common wardrobe staples that most people probably already own and then uses some clever accessories to give the costumes the finishing touches. Practically perfect in every way! Remember Bob Ross and his painting lessons? There was always a happy little tree. 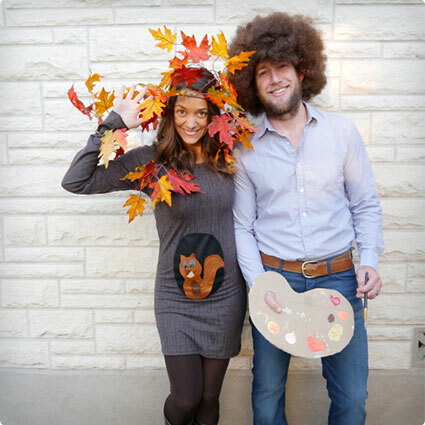 We never did figure out what made the tree so darn happy, but we did figure out that this makes a cute couples costume! This tutorial will give you some pointers on how to create your own Bob Ross and Happy Little Tree costumes. Pokemon Go is everywhere right now, so we fully expect to see some Pokemon related costumes around this coming Halloween. 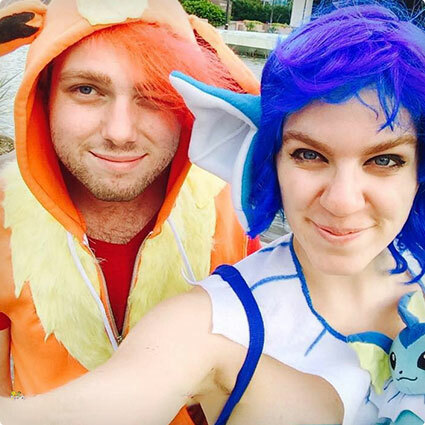 One of the cutest that we have seen so far is this Vaporean and Flareon couples costume! These guys modified a pair of shorts and a sweater for Flareon and a dress for Vaporean. We especially love Vaporean’s tail! 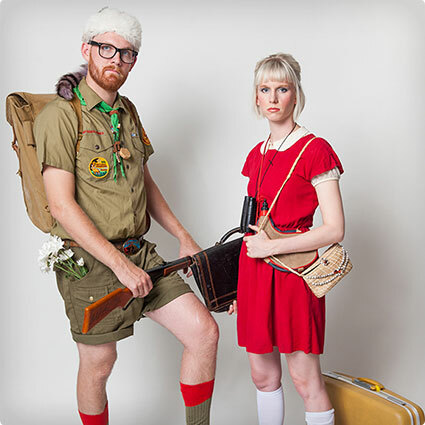 One couples costume that we have actually been seeing quite a bit of lately is the young runaways from Moonrise Kingdom! Clearly the 2012 movie is enjoying resurgence. Whatever the reason, we love this take on Sam and Suzy and we think that you are going to love it too! Who doesn’t love a bot of a nineties throwback from time to time? This tutorial is going to help you to do just that with an easy guide to replicating these adorable Patti Mayonnaise and Doug Funnie costumes for less than $50 per costume – pretty sweet, right? 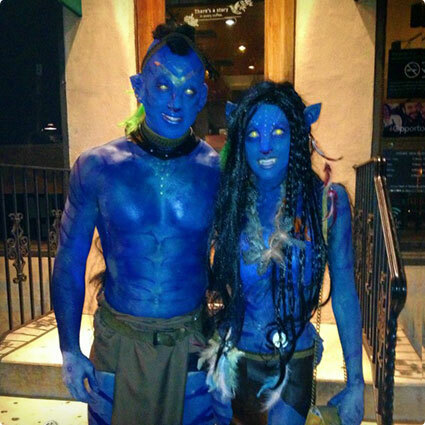 Break out the blue body paint and tap into your creative side to create these matching Avatar costumes. 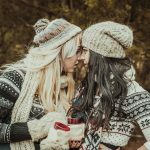 This is going to take some time to achieve and it does require a bit of artistic talent to do well, but we are sure you will agree that they look stunning and you will two if you follow the step by step guide! 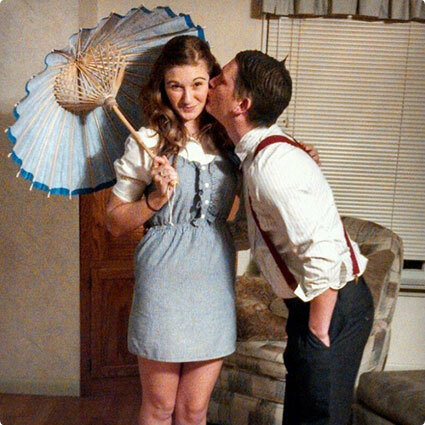 Lots of couple’s costumes seem to stem from classic movies and this one is no different. 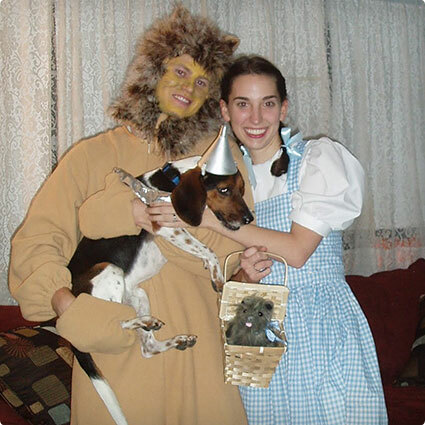 Dorothy Gale and the Cowardly Lion are an ideal pair to dress up as. The costumes here use sewing patterns, but the tutorial walks you through the tweaks that were made to make them just right. 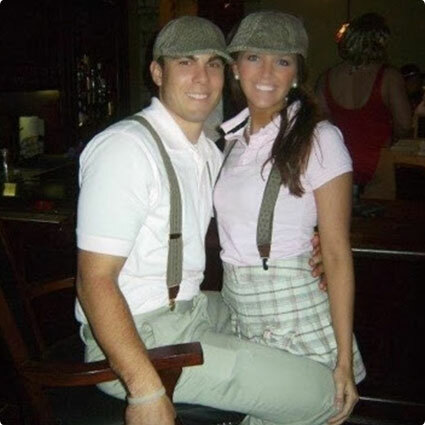 Lots of couples like to participate in activities together, including golf and this is a really cute couples costume to try. It doesn’t take a huge amount of effort and even if you are not actually golfing fans, you can probably cobble these outfits together without all that much trouble! 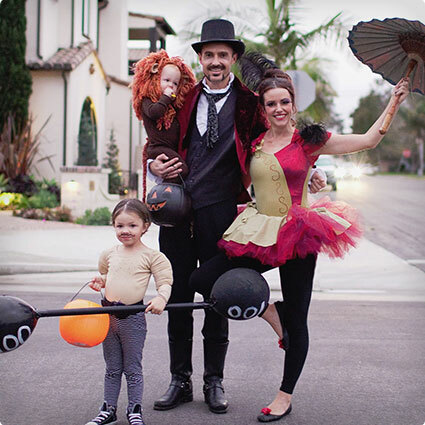 We really love this Circus Couple – in fact, it is actually a circus family costume, so if you do have kids you can all dress to the theme. However, if you are a couple only, then you simply focus on the acrobat and the ring master costumes and you will be good to go! How adorable are these Darla and Alfalfa costumes from The Little Rascals. This is another one of those costumes that looks fantastic, but it is easy to achieve. Alfalfa is mostly about the hair since most people have the shirt, bow tie, suspenders and trousers to use. Darla is a little more difficult as modifying a dress may be required. 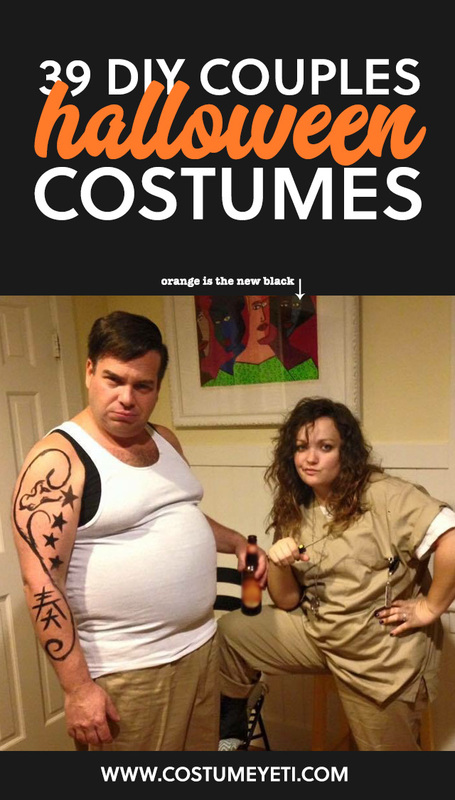 Here is another really easy DIY costume for you to try this Halloween when you go out as a couple. The Lumberjack part is really easy to achieve with a flannel shirt, jeans and some prop items. The tree is also pretty simple; you just need a brown dress and some leaves to make a headpiece. 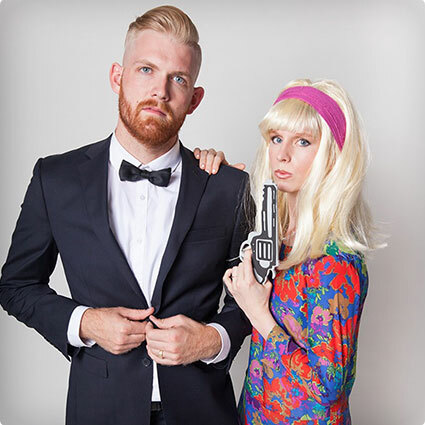 A classic combination for couples dressing up at Halloween is the James Bond and Bond Girl pairing. James Bond is easy – wear a sharp suit and tuck a gun into your tux pocket. As for the Bond girl? Well, you have so many that you can choose from! This particular one is taking it back to the sixties. 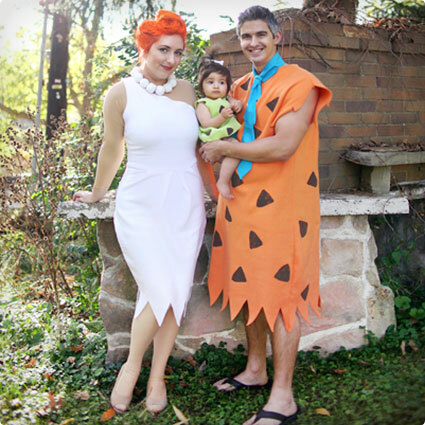 These Fred & Wilma Flintstone costumes are actually for little kids, but as we have mentioned over and over again – you can easily follow the same steps on a bigger scale to accommodate adults. This version of the costumes is made from felt fabric using a t-shirt as a pattern. 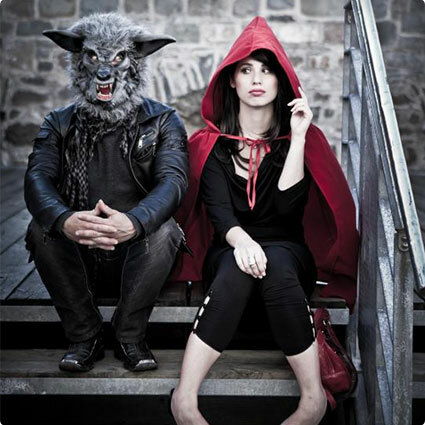 This take on Little Red Riding Hood and the Big Bad Wolf has an edgier feel to it! No cute fairytale here! Red is wearing all black with sultry make up and her signature red cape while the Wolf is rocking jeans and leather. The hardest part about DIYing a wolf costume is the face, but in this version the mask is store bought.